That’s just one example of how Cabrera practiced continuous improvement in her classroom at Stuart Middle School in Commerce City, Colorado. 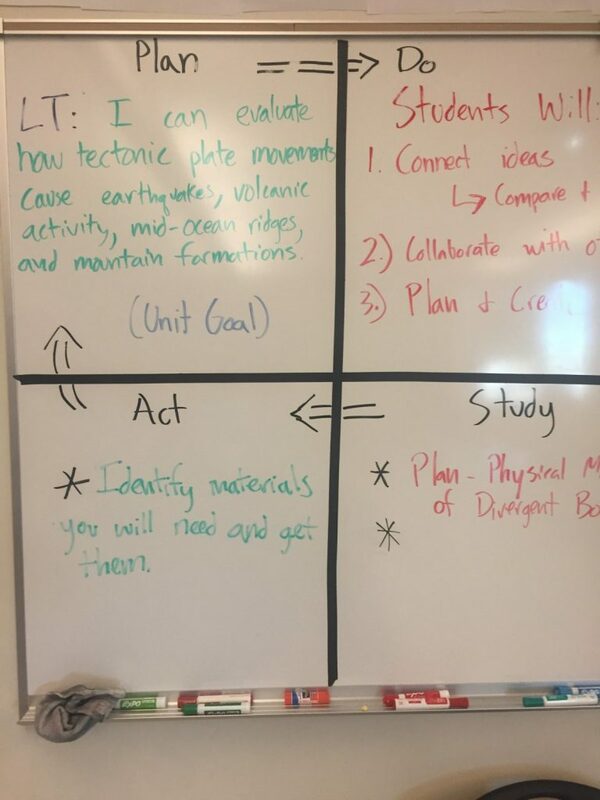 During the 2016-17 school year, she started showing charts to her students. 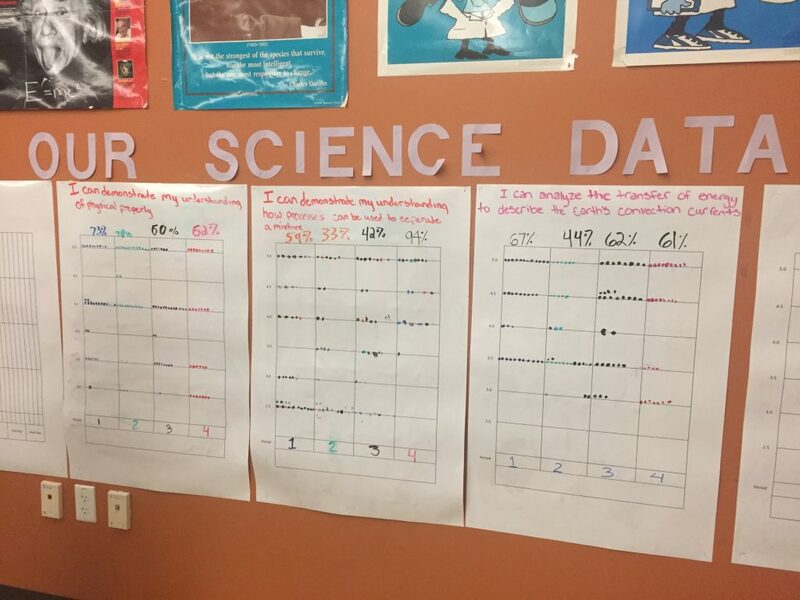 Those graphs revealed how well the classes were scoring on algebra and geometry problems. Cabrera changed her approach as the result of her school district’s efforts to boost student achievement on state-mandated tests. In 2015, School District 27J’s scores were below state averages on the Colorado Measures of Academic Success. “And this is a school district that’s used to being above the state of Colorado. So we walked beside them,” says Becky Hoffman, executive director of the Youth Initiative of Adams County — a local community partnership that’s part of the national StriveTogether Cradle to Career Network. 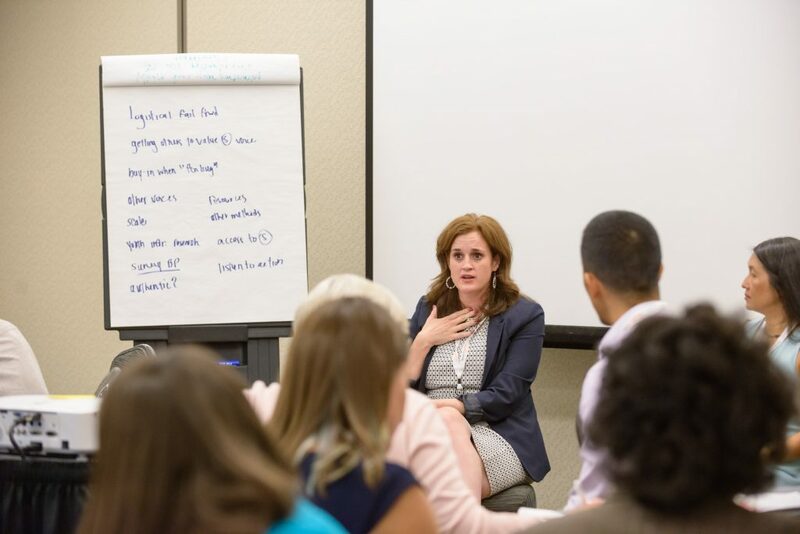 “Walking beside” the school district meant guiding its educators to find ways of using data to make sure students are learning what they need to know. “It’s helping our partners identify the right resource for the right kid at the right time,” Hoffman explains. The Youth Initiative of Adams County has been helping schools in this suburban county near Denver since 2006. “We are really one of the fastest-growing communities in the state of Colorado, and we have one of the highest proportions of kids to adults in Colorado,” Hoffman says. Just over 27 percent of the county’s half-million residents are younger than 18 years old, according to a U.S. Census Bureau estimate for 2016. Cabrera has been part of the faculty at Stuart Middle School since it opened in 2008. “The building is in an area that was very rural and has been developing at an incredibly fast pace,” she says. “Our school opened with about 350 students or so. And we are up to 905 this year. It’s beginning to get crowded.” About half are Hispanic, and most of the other half are white. As an indication of the poverty in this community, Cabrera notes that about 30 percent of the students get free or reduced-price lunches. Hoffman says her organization suggested continuous improvement as a strategy for School District 27J. But talking about this method is one thing — and seeing it is another. “It wasn’t doing any good for me and my team to keep saying, ‘You should use continuous improvement,’” Hoffman recalls. Cabrera’s fellow travelers were the instructional coach at her school, District 27J’s instructional coach and the district’s chief academic officer. Hoffman says it was important to include people from all these different levels of the school system. “We were looking for teams with three levels of leadership,” she says. That’s a way of making sure the trip didn’t result in one teacher trying out these instructional methods in isolation. Instead, the travelers would bring back what they’d learned together. Cabrera says the trip to Wisconsin was an “eye-opener” for her. “The students there were definitely more involved,” she recalls. 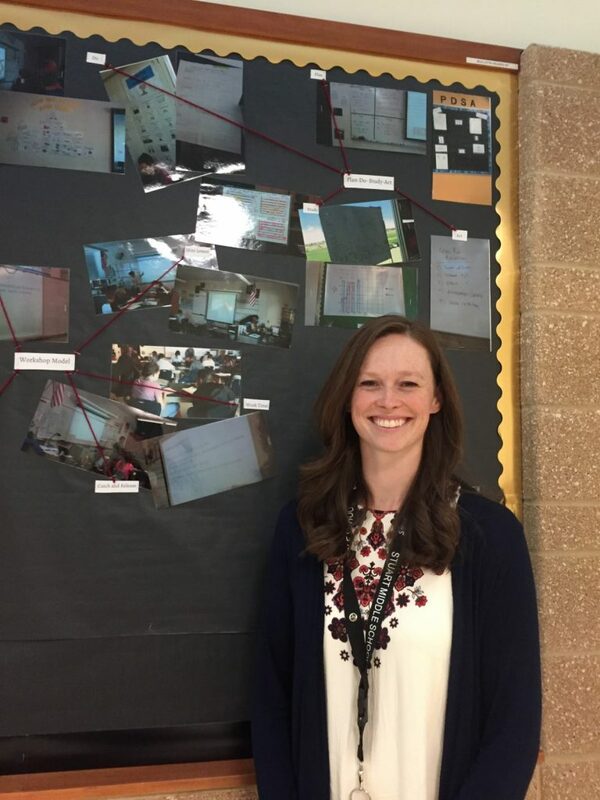 Unlike the teachers at her school in Colorado, who typically talked only among themselves about instructional methods, the teachers in Menomonee Falls also discussed these issues with students. Student Feedback on Performance Data in the Classroom from Youth Initiative of Adams County on Vimeo. When the students said they needed help on a particular topic, Cabrera had to find new math problems for them — sometimes pulling these lessons from the school’s textbooks, but also searching on Google or creating lessons from scratch. Last year, Cabrera was teaching four sections with an average class size of 44. With that many children, it can be difficult to focus on each individual’s needs. But Cabrera says the continuous improvement process made that a bit less challenging. “I knew better which kids needed what,” she says. And the kids seemed more eager to help one another. “It made it less of a stigma to have a lower score, because everybody knew they would support each other and help each other out,” she says. 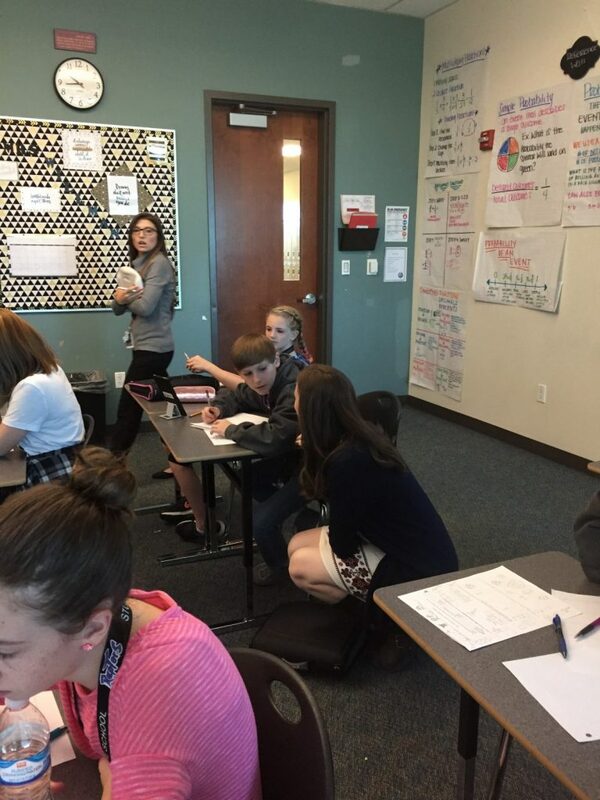 “Kids will say, ‘Maybe I’m not very good at this learning target, but my friend is — and they can help me,’” says Krista Dean, Stuart Middle School’s assistant principal (who was the instructional coach last year). And other students tell their classmates, “Hey, I know this. I can help you,” according to Dean. Stuart Middle School improved on state tests last year: The school’s overall score, based on student growth and achievement, was 58.3 in 2017, up from 49.2 in the previous year, Dean says. Stuart had been in a category of schools that needed improvement, according to Colorado’s standards. Now those new test results landed it in the “performance category” — meaning that the school meets or exceeds statewide attainment on performance indicators. The improvement was noticeable in Cabrera’s subject, eighth-grade math: 23 percent of last year’s students met or exceeded expectations on state tests, up from 8 percent in the previous year — and coming in higher than the Colorado state average of 21 percent. What changed in Commerce City, Colorado? 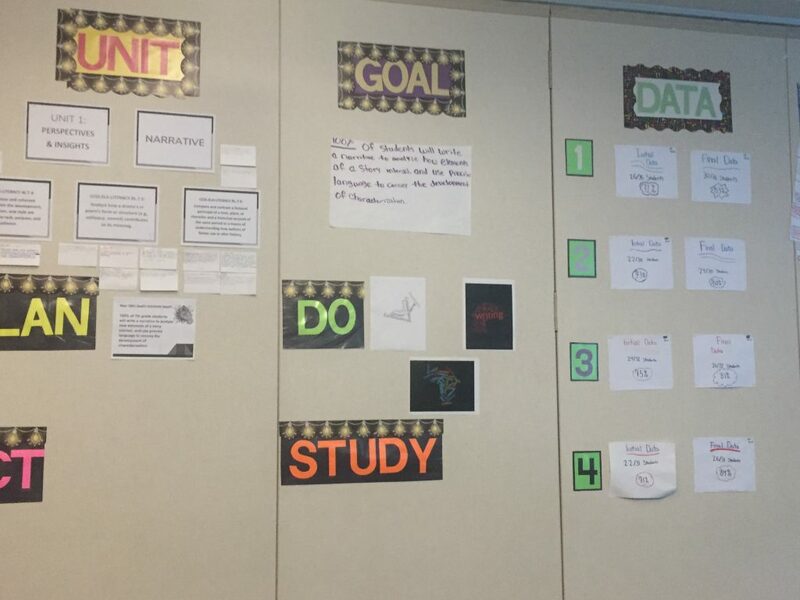 The Youth Initiative of Adams County is working with Stuart Middle School in School District 27J to use continuous improvement in classrooms, as a way of boosting student performance. Overall, the school improved on state tests last year: 58.3 percent of students showed growth in their learning in 2017, up from 49.2 in the previous year. “We saw a huge increase,” Assistant Principal Krista Dean says. In eighth-grade math, 23 percent of students met or exceeded expectations on state tests in 2017, up from 8 percent in the previous year. That percentage is higher than the Colorado state average of 21 percent. In earlier years, Colorado categorized Stuart as a school where test scores showed a need for improvement. Stuart’s scores in 2017 moved the school up into a new category called “performance,” meaning that the school’s students are meeting the state’s goals. About half of Stuart’s teachers were using continuous improvement by the end of the 2016-17 year. Now, teachers are using in practically every classroom, according to Dean. “People are starting to have a clearer understanding of what it means and how we use it to drive our instruction,” she says. Share the data. When teachers post scores showing a class’s progress, the students get a clearer picture of where they need to improve. Get the students more involved. Teachers should be open to hearing students’ suggestions on where they need to sharpen their knowledge — and how they might go about doing that. The school needs a whole team. Whenever a teacher begins using continuous improvement, it’s a big help if other teachers in the school are pursuing the same goal, along with administrators and instructional coaches. Youth Initiative of Adams County is a collect impact collaborative with more than 75 organizations committed to the academic success of over 100,000 students. Serving Adams County, Colorado, the local partnership is a member of the StriveTogether Cradle to Career Network.